Today marks the 30th anniversary of the release of “The Empire Strikes Back,” the interesting part of the original “Star Wars” trilogy, before those annoying Ewoks showed up. Billy Dee Williams still looks like he ought to be carrying around a can of malt liquor, but he does bring the pretty better than C3PO. If you’re planning a viewing party, see a Death Star carved from a watermelon and a Storm Trooper made from Monterey Jack cheese, plus other fan tributes, here. The rising tide of popularity of other root vegetables – beets, carrots, daikon, even turnips – does not seem to have lifted the humble radish. 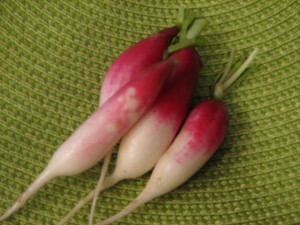 And that’s too bad, because I love radishes. The crunchy texture, the nip of peppery flavor and, most of all, the cheerful color. How can you not have a good day when you look at that magenta-red? Yes, if radishes get too large and dried out, they may taste like you bit into a pepper grinder. But now, spring, is the radish’s prime time. Get them fresh-picked from a farmers market or through a CSA, as I did this week, and they are moist, wonderful vegetables – not things to scrape off your salad. Even the leafy tops – again, if they’re fresh-picked and bright green – are good. Raw or sauteed; just try it. Actually, I think the tops of most vegetables are good to eat (carrots the exception) if they are fresh enough. I learned today that Turkish cooks make baklava in a rolled-up form. However you slice – or curl or mold – it, it’s still honey-drenched goodness. That and more is in an occasional series on ethnic cooks in the Triangle in The News & Observer (Raleigh, N.C.) food section. The story and recipe are here. Memphis In May is the Daytona 500 of barbecue contests. If you win there, you are king of ‘cue. A Charlotte man was part of a team that won first place for chicken – and it was the first time he’d entered any cooking contest. Read about him in the Charlotte (N.C.) Observer here. There are jelly-filled doughnuts, then there are the pillow-like Berliners that Durham, N.C. bakery Guglhupf produces. The Independent Weekly (Durham, N.C.) actually has the bakery’s recipe here. “Can she bake a cherry pie, Billy boy, Billy boy?” Well, Emily Spaugh of Winston-Salem, N.C. can, and won a national prize for it. She’s just 18, and carrying on a family tradition. Read more in the Winston-Salem Journal, here. And I thought we loved pig in North Carolina: A fight broke out at a pig cook-off in Portland, Ore. Police were called. It was all over the birthplace of the winning porker. Read about the squealing brawl in The Oregonian, here. Utah isn’t a hotbed of craft beers, but a new brewery is opening in Salt Lake City that will focus on “high gravity” beers – that’s beers with a lot of alcohol. Find out how that happened in the Salt Lake Tribune, here. This is straight from a schedule of events at the Museum of the Albemarle in Elizabeth City, N.C. I think a pirate would have to get pretty hungry to be willing to eat a Hot Dog Telescope. And I’m not sure what pirates have to do with potatoes, unless they shot them from their cannons. May 14, Friday, 5 p.m. – 8 p.m., Dine With A Pirate. Belly up to the table with members of Blackbeard’s crew and feast on Buccaneer Burgers, Hot Dog Telescopes, Gold Nuggets (Tater Tots), Shiver-Me Timbers Chilled Fruit, Land Lover’s (sic) Seaweed (cole slaw). May 15, Saturday, 9 a.m. – 4 p.m. Pirate Public Day. Held in conjunction with the Potato Festival, members of Blackbeard’s Crew, a Virginia-based historic reenactor group, will once again invade Museum of the Albemarle for the public to experience a pirate’s way of life through a live encampment and demonstrations. People of all ages will be educated and entertained through opportunities to participate in hands-on activities and open discussions with the pirates. Fast food is all about consistency. People want to know that they’ll get the same food at a drive-through in Rochester as they will at one in Raleigh. So, I was intrigued by the seeming contradiction of being asked to judge the regional finals of a biscuit contest for McDonald’s in Cary, N.C. Bakers at each store have a list of rules to follow and everyone has the same ingredients – not much of a contest, I thought. The biggest challenge was sheer number – there were 12 entries. Even taking just a bite of each would mean eating the equivalent of three or four entire biscuits. My fellow judge, Cary Mayor Harold Weinbrecht, boasted that he had gone for a run in preparation for the marathon. I, in contrast, had merely foregone any bread at lunch and walked briskly to my car. The mayor and I were handed a detailed score sheet. We had little metal rulers to see if the biscuits hit the requisite 1 1/2 inches in height. We were told to check the brownness of the tops and the whiteness of the sides, the amount of pebbly texture on the tops and the fluffiness of the centers. Can a good biscuit be scientifically quantified? They were trying. I was surprised – even with all the rules and being baked in the same McDonald’s kitchen, each baker’s biscuit was a little different. Even in the standardized fast-food world, it makes a difference whose hands mold the biscuits. The regional winning bakers were Angelica Hernandez from the Falls of the Neuse Road store, Elena Salgado from the South Street store, Gustavo Sanchez from the Kildaire Farms Road store and Mariana Morales from the Garner store. They will compete next week in the state finals. A useful and timely piece in The News & Observer (Raleigh, N.C.) pulls back the veil on shopping at farmer’s markets. Depending on which market you’re standing in, that farmer you’re buying strawberries from may have never touched them. Great list of markets, too. Read the article here. I love farmer’s markets, but you do need to be aware of the restrictions (or lack of them) for specific markets. Also, dogs are not allowed at most of them, and correct change is always appreciated. At the Charlotte (N.C.) Observer, Kathleen Purvis plays tour guide in New York City for fellow food writer Andrea Weigl. They actually ate salads. Once. Read the revelations here. Instead of finding out just how low your bank balance is, you can get a big scoop of Maple View Farms ice cream at a new emporium in Raleigh. The Independent Weekly (Durham, N.C.) says that Fresh on Glenwood Avenue is in a converted bank building, and the former drive-up teller window now has a sweeter function. Read more here. How does a self-respecting White House pastry chef cope with the healthy eating habits of the Obamas? He doubles as First Beekeeper. Read more in the New York Times, here. A new volunteer organization modeled on AmeriCorps aims to bring fresh, local food to public schools. Read more in The Portland Oregonian, here. I wasn’t exactly sure why I should be on Twitter. Do people really want to know that I had Cinnamon Chex for breakfast? But I’ve joined the flocks and am having a pretty good time, although I’m appalled at Al Gore’s spelling. And if someone is boring, at least they’re boring for only 140 characters. And I’m already part of a Tweetup! The Triangle Foodie Tweetup will be held at the new beer garden at Fearrington Village in Pittsboro, N.C. on May 19, 6 p.m. to 9 p.m. Visit here for details and to sign up. Andrea Weigl at The News & Observer in Raleigh, N.C. got the whole thing started. Come on down, have great beer and food, meet foodies and maybe win a prize. I will also be signing my four cookbooks. If you really want to know my cereal habits, I’m @DebbieMoose on Twitter. Lots of news in The News & Observer (Raleigh, N.C.) today. Chef David Mao, late of The Duck and Dumpling, will open a dumpling and noodle shop. Unfortunately, it’s in what has become the Bermuda Triangle of restaurant locations, the corner of Hillsborough Street and Oberlin Road (Red Hot and Blue was the latest victim). I hope Mao has had someone come in to remove the bad karma. Also, there’s information about a new local cookbook and a James Beard writing winner with local ties. Read it all here. What cooks learned from Mom is the subject at the Charlotte (N.C.) Observer. Good thing I didn’t listen to my mother’s cooking tips, or I’d be leaving fried chicken on the counter in 90-degree heat for five hours and making sure every Wednesday is Salisbury Steak Night. I still can’t go near a pressure cooker, thanks to her (didn’t you know they’ll explode??). Read memories from the children of less odd cooks here. It’s in the N&O, too. The Winston-Salem (N.C.) Journal has easy ways to make main-dish salads, good news for me, since I am drowning in leafy greens. Read more here. In Oregon, they call them hand pies, but we call them turnovers. By any name, they are delicious and easy to make, if you follow the instructions in today’s Portland Oregonian. Start here to make savory or sweet hand pies. Give a hand to Andrea Weigl at The News & Observer (Raleigh, N.C.) and Kathleen Purvis at the Charlotte (N.C.) Observer for being finalists in the annual awards of the Association of Food Journalists. Weigl is nominated in two categories. Read more about the awards and AFJ here. The winners will be named at AFJ’s annual conference in September.